Bring a large pot of water to a boil. Cook the pasta, Drain pasta and set aside. Melt the butter in a large skillet, over low heat. Add the cubed cheddar and melt until creamy, stirring constantly. Add the egg and stir until egg is mixed into the cheese. Add pasta to skillet and stir until combined. Stir in the half n half and cream cheese, until cream cheese has melted into the pasta. 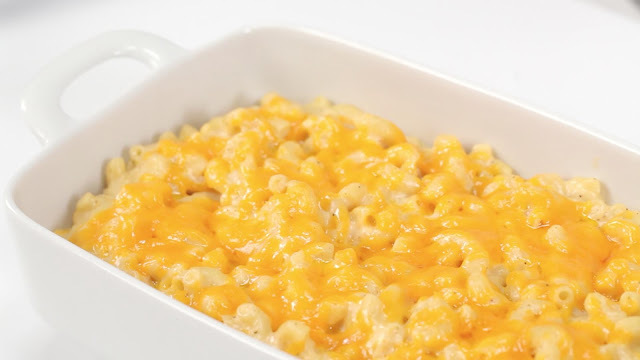 Add half of the pasta mixture to a 9-by-13-inch baking dish and top with half of the ¼ cup of parmesan cheese. Add the remaining half of the pasta, followed by the remaining parmesan.